Nutrimill with Limited Lifetime Warranty. Innovative variable high speed grain mill. Advanced technology includes: Improved texture control, stronger milling heads, unique Force Flow sound/air chamber design which results in 50% noise reduction, improved motor cooling, and longer life. The popular Nutrimill micronizing grain mill provides a range of flours from "pastry fine" to "coarse as cornmeal" with an extra large hopper and removable flour canister. 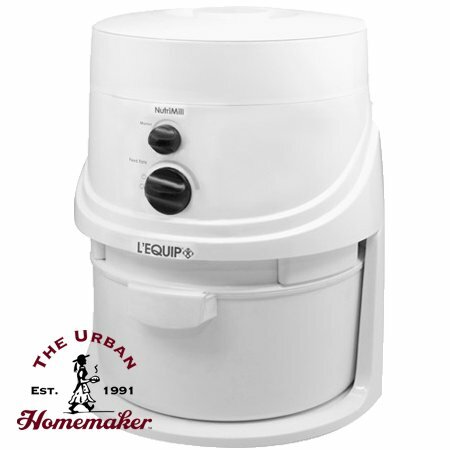 The grain hopper and flour canister are both large enough to mill flour for up to five or six large loaves of bread, or about 21 cups of flour without having to refill the hopper. Eating whole grains on a regular basis helps prevent cardiovascular disease, stroke, heart attacks and clogged arteries. Comments: It is so much better than the Magic Mill I use to have. Much quieter than the MM. It also is very good grinding corn for cornmeal. I use it for all my grains except the oily ones of course. It's just a great machine. Comments: I am only giving it a 4 because I haven't used it that much, yet. I tried it with soft wheat for a fine grain and it worked wonderfully. The only real "problem" I have is that the bowl is plastic. I would like it if they made a glass bowl as the flour tends to stick to the plastic because of the electricity. Other then that I like the machine and will use it very often. Comments: I love this grain mill. Very quick and not messy. I got the bagger with it and that really comes in handy.